Our flight today from Mumbai to Srinagar was uneventful, we had a lady pilot and had rough weather..and rough landing. No issues in checking out luggage out of the airport.. our local contact informed everything was peaceful at Srinagar today.. After many days today curfew was called off till 2pm. That good new.. Bad news lot of traffic to reach Dal Lake as everybody wanted to go out.. So over an hour in traffic we finally were in Shikara riding towards our Super Super Deluxe 5 Star House Boat.. The Peak of Kashmir Hospitality. Without waiting any further we satisfied our famished hunger with delightful Kashmirs food served with lots of love. 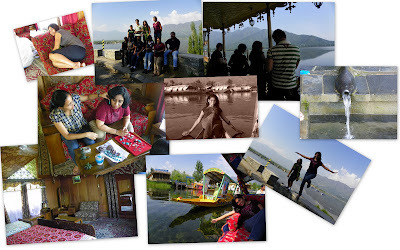 Details to be share later.. bullet points..
Shikara Rides; Mughal Gardens; Interactions with locals.. Shankaracharya Temple... House Boat.. We would now like to put our feets up.. but damn it I have to prepare couple of corporate proposal before that is done.. Tomorrow we hit early morning 5 for culture experience in Vegetable Market.. then head for Sonmarg, Zojilla, ... Lamayuru.. and Ulley Camp.. and lots of inbetween adventures..
Wow looking very exciting..have fun guys and keep on posting.